Vetrap Animal Bandage, the first name in flexible wrap, has become known around the world as the preferred self-adherent bandaging tape. 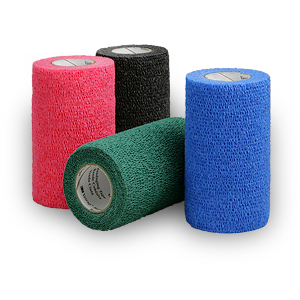 Vetrap bandage is an elastic bandage which is strong and provides support. Applies pressure to inhibit bleeding. Is flexible enough that when used properly with padding it will not cut off circulation. Adheres to itself so no clips or fasteners are needed.